Star Wars: The Force Awakens (also known as Star Wars: Episode VII – The Force Awakens) is a 2015 American epic space opera film produced, co-written and directed by J. J. Abrams. It is the first installment of the Star Wars sequel trilogy and the seventh installment of the main Star Wars film franchise, following Return of the Jedi (1983). The film stars Harrison Ford, Mark Hamill, Carrie Fisher, Adam Driver, Daisy Ridley, John Boyega, Oscar Isaac, Lupita Nyong’o, Andy Serkis, Domhnall Gleeson, Anthony Daniels, Peter Mayhew, and Max von Sydow, and was produced by Lucasfilm Ltd. and Abrams’s production company Bad Robot Productions. The Force Awakens is the first Star Wars film to not involve franchise creator George Lucas. Set 30 years after Return of the Jedi, the film follows Rey, Finn, and Poe Dameron’s search for Luke Skywalker and their fight alongside the Resistance, led by General Leia Organa and veterans of the Rebel Alliance, against Kylo Ren and the First Order, a successor to the Galactic Empire. The Force Awakens was announced after The Walt Disney Company’s acquisition of Lucasfilm in October 2012. The film was produced by Abrams, his longtime collaborator Bryan Burk, and Lucasfilm president Kathleen Kennedy. Abrams and Lawrence Kasdan, co-writer of the original trilogy films The Empire Strikes Back (1980) and Return of the Jedi (1983), rewrote an initial script by Michael Arndt. John Williams, the composer for the previous six films, returned to compose the film’s score. Lucas served as creative consultant during the film’s early production. Filming began in April 2014 in Abu Dhabi and Iceland, with principal photography also taking place in Ireland and Pinewood Studios in the United Kingdom, and concluded in November 2014. It is the first live-action Star Wars film since Revenge of the Sith (2005). 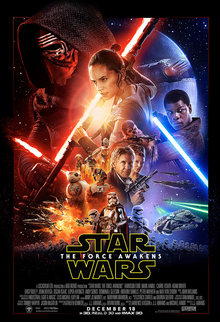 Star Wars: The Force Awakens was widely anticipated, and Disney backed the film with extensive marketing campaigns. It premiered in Los Angeles on December 14, 2015 before its wide release in the United States on December 18. The film received positive reviews, with praise for its acting, screenplay, direction, musical score, visual effects, and action sequences, although it received some criticism for being derivative of the original trilogy. The film broke various box office records and became, unadjusted for inflation, the highest-grossing installment in the franchise, the highest-grossing film in North America, the highest-grossing film of 2015, and the third-highest-grossing film of all time, with a worldwide gross of over $2 billion and a net profit of over $780 million. It received five Academy Award nominations and four British Academy Film Award nominations, where it won the award for Best Special Visual Effects. It was followed by The Last Jedi in December 2017, with Episode IX scheduled for release in 2019.